DEARBORN, Mich., Jan. 7, 2016 – Ford Motor Company will create the ultimate automotive enthusiast and consumer experience at the 45th Annual Barrett-Jackson Scottsdale Auction, Jan. 23-31, in Scottsdale, Arizona. 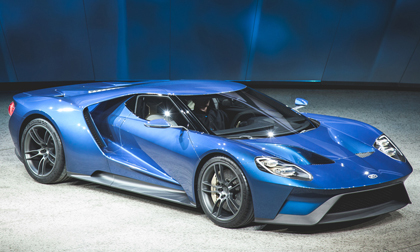 Ford will feature high-octane attractions for automotive enthusiasts of all ages, including its latest Ford Performance lineup, hot laps in the all-new Shelby® GT350 and ride-and-drives in some of the company’s latest vehicles. Star attractions include the highly anticipated Ford GT supercar, Focus RS and all-new Shelby GT350 – all part of a special display where the public can get an up-close look at these performance-packed cars. Fans seeking a more exhilarating experience will have the opportunity to take hot laps in the new Shelby GT350 around a closed course with a professional driver from Ford Performance Racing School.